Huge thanks to everyone who gave on #GivingTuesday (November 28, 2017). Together we raised more than $9,000, almost doubling the fund we tap into to meet classroom needs that arise throughout the school year. This year, our emerging needs fund helped cover the cost of adaptive reading software for kindergartners, classroom activities for the redesign of our playground, support for Hawthorne's homeless students, and more. thanks to you, we'll meet even more emerging classroom needs next year. for your child and every student at Hawthorne! Donations to Friends of Hawthorne are welcome at any time. 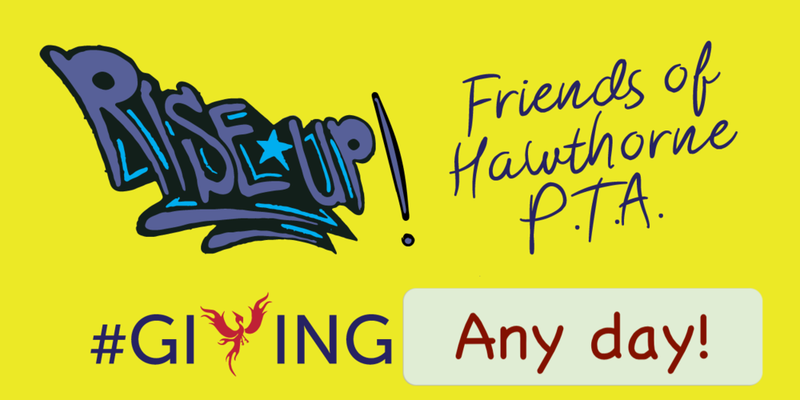 You can give online via PayPal or by check (made payable to Friends of Hawthorne PTA). Drop it off in the school's front office or mail it to Friends of Hawthorne PTA, Phoenix Fund, 4100 39th Avenue South, Seattle, WA 98118.